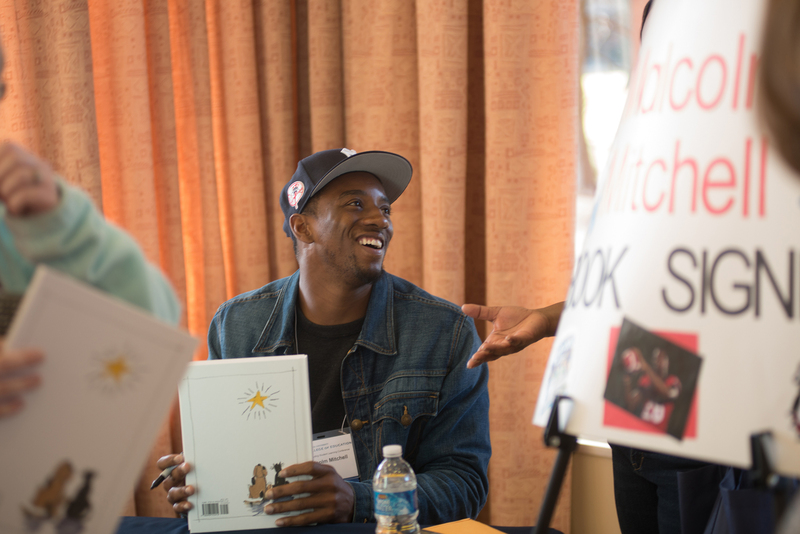 Books for Keeps – Books for Keeps is partnering with Malcolm Mitchell! Books for Keeps is partnering with Malcolm Mitchell! 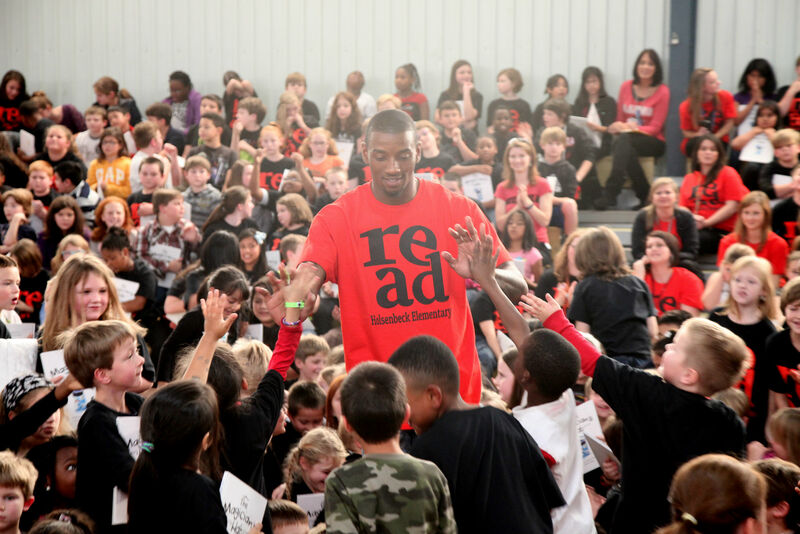 On March 31, 2016 we officially announced a partnership with former UGA wide receiver and reading advocate Malcolm Mitchell. We are so excited to share the details of that partnership here. Our press release announcing the initiative – to give a copy of Malcolm’s book, The Magician’s Hat, to every first-grade student in the Clarke County School District – is below. To make a donation to this initiative, please visit our Donate page. Make sure to designate your gift toward the Read with Malcolm partnership when you donate. And thanks! 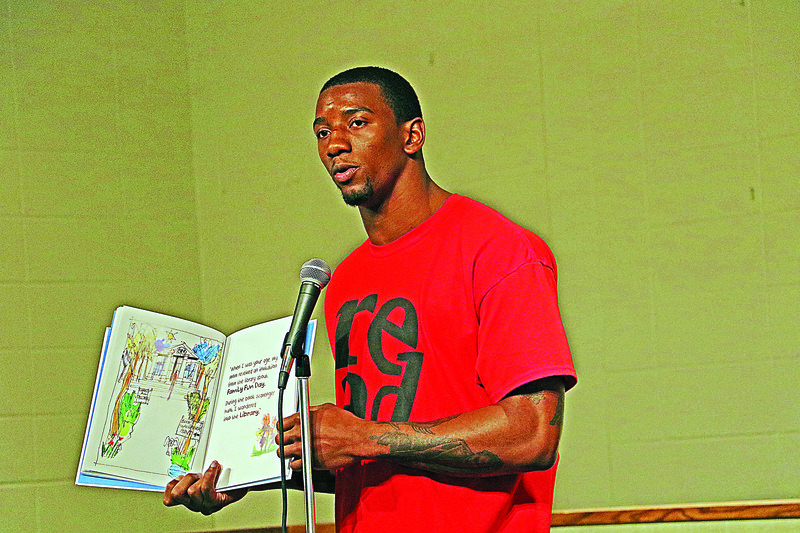 ATHENS, GA. – March 31, 2016 –Books for Keeps and former UGA wide receiver Malcolm Mitchell are launching a partnership to ignite a passion for reading in Athens students. Together, Mitchell and the Athens-based nonprofit plan to provide a copy of Mitchell’s book, The Magician’s Hat, to every first-grade student in the Clarke County School District this spring. Read with Malcolm and Books for Keeps are working together to raise the funds necessary to provide books to all 1,200 first-grade students in Clarke County this May – a $15,000 fundraising endeavor – and are calling on the community’s support. Mitchell published his book after discovering and nurturing a love for reading while he was a student-athlete at The University of Georgia. After struggling to improve his own reading level, he joined a book club and was overwhelmed by the way that reading united him with other people and sharpened his focus – even making him a better football player. He has since embarked on a mission to share that sense of magic and empowerment with children all over Georgia. Books for Keeps is providing the seed funding for a purchase of 1,200 copies of The Magician’s Hat. With the help of Mitchell and his Read with Malcolm organization, the nonprofit is seeking to raise the additional $15,000 necessary for the purchase before May 1. Donations may be made at www.booksforkeeps.org or by check sent to Books for Keeps, P.O. Box 49761, Athens, GA 30604. Books for Keeps’ flagship program, Stop Summer Slide!, distributes 12 books to every child in nine Clarke County elementary schools. Barnett Shoals Elementary School is the latest added to Books for Keeps’ service list, and will be served for the first time this May. Under the initiative with Malcolm Mitchell and Read with Malcolm, the students at every Clarke County School District elementary school will receive a free copy of The Magician’s Hat, regardless of whether those students are in Books for Keeps’ current service population. For more information, contact leslie.hale@booksforkeeps.org or (706) 410-1912. About Books for Keeps: Books for Keeps started as one woman’s effort to help a child who loved to read but had no books at home. It grew from a grassroots movement into a research-based program to end summer slide by ensuring children have access to books when school lets out. The nonprofit was incorporated as a 501(c)(3) tax-exempt organization in 2011. Books for Keeps distributes books to students ranging from pre-K through 12th grade. The flagship elementary school program, Stop Summer Slide!, is based on a University of Florida study that found giving economically-disadvantaged elementary school children each 12 high-interest books at the beginning of summer had an impact on reading achievement statistically similar to attending summer school. Since its founding, the organization has given 185,000 books away to children in Northeast Georgia. Books for Keeps distributed nearly 60,000 books in 2015 to children, teachers, and partner organizations in Athens, Atlanta, and Warrenton, Ga., focusing on 10 elementary schools with high percentages of low-income families. It has plans to expand to 15 additional schools in the next three years, reaching more than 11,000 children with more than 140,000 books annually. 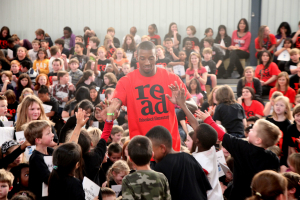 About Read with Malcolm: “Read with Malcolm” is a youth literacy initiative founded by Malcolm Mitchell. The goal is to expose early readers in under-served communities to the long term benefits of being an active reader. “Read with Malcolm” supported by Share the Magic Foundation presents an opportunity for community activists to introduce book ownership to students in households where reading is not a priority, and improve youth literacy in communities with below grade level reading skills. Malcolm Mitchell’s book, “The Magician’s Hat,” reinforces the Author’s broader message that reading is a critical component and necessary skill to compete effectively in life and fulfill an individual’s potential and pursuit of dreams. Through the “Read with Malcolm” program, children are not only given a book of their own, but also encouraged to explore Malcolm’s message that reading can expand your curiosity, creativity and learning. By booksforkeeps|April 4th, 2016|Uncategorized|Comments Off on Books for Keeps is partnering with Malcolm Mitchell!